Funding for education comes largely from property taxes, so wealthier communities have significant advantages over poorer communities; some of them include: scope of extracurricular activities, quality of teachers, and availability of learning resources. (As a high school soccer official, I have learned you can tell a lot about a community by the state of the school building and facilities and a general vibe from team members and the coach.) Vander Ark suggests considering funding education on a ‘per student’ versus ‘per community’ basis to address an achievement gap. Online learning is scalable and cost-effective so might help make education more egalitarian. Moreover, online and blended learning programs translates to less time sitting in a classroom at a school; therefore, some of the expense associated with maintaining a ‘brick-and-mortar’ facility goes away. Vander Ark talks about ‘playlists’ in a curriculum. Students, teachers and parents participate in planning what skills a student needs and how to build them to reach a desired competency. The end result is a ‘playlist’ – a sequential, personalized, and adaptive learning approach. Self-guided learning. There are no boundaries in building an expertise with a skill set. If a student identifies a core-competency or passion, he or she continues to build necessary skills online. The rigid, time sapping structure of subjects tied to grades is less relevant. Competency based learning. Teaching experts all talk about the need to move away from learning based on grade levels where students are largely grouped based on age. Rather, students should learn based on how they learn best and what motivates them. It is more effective to tie competencies to the building and validating of a skill set – especially as students learn at varying rates and levels. Plethora of online learning resources. 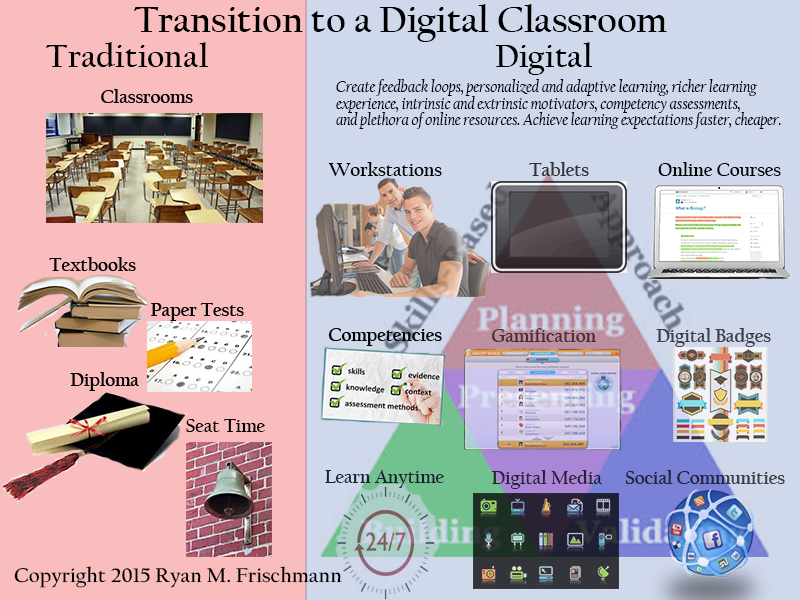 Students might learn from online courses, games, social media communities, video tutorials, and digital media (e-books, whitepapers, blogs, articles, and slideshows). It is practical and efficient to think in terms of skills when you are building skills from many different sources. Threads education and career planning. Skills are tangible, something you can continue to build and validate after you graduate from high school and college. Think skill sets throughout your life – education, employment, and other experiences. [i] Tom Vander Ark (2014). Getting Smart: How Digital Learning Is Changing the World. San Francisco: Jossey-Bass.